A Nevada-based poker technology company was awarded the top prize at the GIGse conference July 14-16, 2014 in San Francisco. The team presented next generation technology that promises to change the way the game of poker is taught. 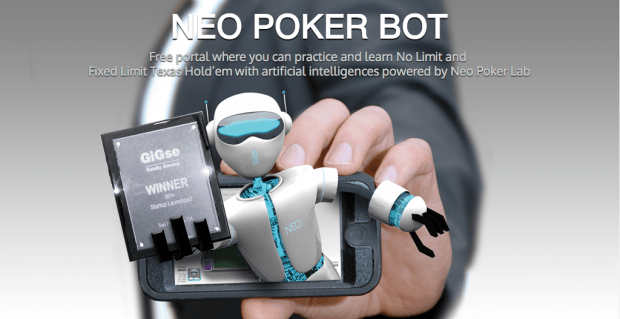 Neo Poker Bot, a poker game that relies on artificial intelligence to teach players how to play poker, garnered 60% of the audience vote and won over three out of the four judges in the invite-only GIGse Start-Up Launchpad competition. “Ninety-five percent of people that play real money gaming lose money. There are no other training tools out there that actually improve your game,” said Neo Poker Bot CEO Rob Gallo, a 17-year veteran of real money online gaming. What separates Neo from other poker teaching tools is the genius of the artificial intelligence. The bots have a deep reservoir of billions of historical hands, which the system has analyzed over the last decade. Additionally, Neo actively catalogues each player’s past and current behavior to adapt to future behavior. After capturing the top spot at GIGse, and coming off back-to-back wins in the 2012 and 2013 Annual Computer Poker Competition, Neo Poker Bot executives say they are in a prime position for growth. Rob Gallo said the company is currently in talks with prospective investors for the next round of funding and is actively seeking other growth opportunities. With a valuation of $6 million, and associations with advisors such as WSOP Champion Chris Moneymaker and highly regarded poker pro Kenna James, the company is on the precipice of making its early investors a sizeable return. “Getting involved with us now promises a great return for potential partners. Within nine months, we’ll have a fully completed release of the game,” he said. “We will have partnerships with online gaming companies to be their teaching tool of choice. The valuation of the company is going to increase significantly. The game is currently available in beta online and as a free iOS and Android App.